NEW YORK, Jul 12, 2013/ — Macy’s celebrates the launch of its new Parisian inspired fashion brand, Maison Jules by introducing a limited edition bike, in collaboration with Martone Cycling Company. Feminine, elegant and edgy, Maison Jules targets the fashion savvy Macy’s customer who is hip and trendy but has her own individual taste. Drawing inspiration from casual chic French styling, the collection is composed of key wardrobe staples that can be cultivated into multiple looks. With the current trend of the bike as a key fashion accessory, the collaboration between Maison Jules and Martone bikes is a match made in heaven. 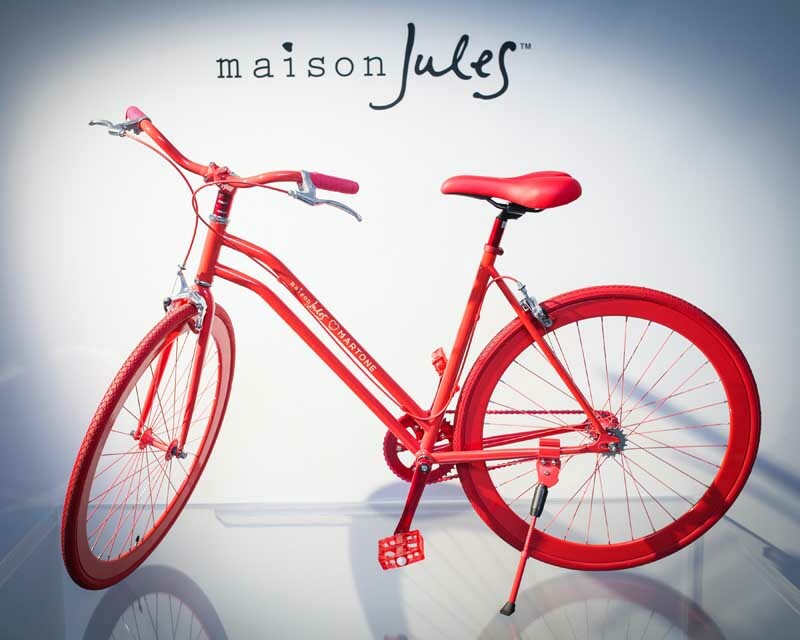 With Maison Jules schedule to launch on August 1, 2013 at Macy’s, “Maison Jules X Martone” 151 bikes will be displayed alongside the collection in Macy’s top doors carrying the line beginning on the same day. The exclusive, limited edition bike is offered in an exclusive coral shade; a key color found within the Maison Jules fall line. Each of the 151 custom Martone bikes will be awarded to one lucky winner per store through an in store text to win contest. Customers can enter by texting the unique code for their store, found in the Maison Jules shop. There will also be a style contest conducted via Instagram in September, in which one grand prize winner will be awarded a trip to Paris, a “Maison Jules X Martone” bike, and a Maison Jules wardrobe valued at $500. Maison Jules will be available in Macy’s Impulse departments and will feature a selection of tops, sweaters, dresses, and pants. Ranging from $17.50 – $119, Maison Jules will bring a uniquely French flair to fashion customers across the country.